Yellow trout-lily belongs to the great lily family, which flourishes in springtime in our gardens and in our native hills and hollows. Across the state, spring would not be spring in Virginia without the entrancing drifts of trout-lilies, trilliums, and other lily kin in April’s sunlit woods. The trout-lily’s nodding, 1-2-inch flowers that bloom a mere 5-10 inches above the ground are miniature lilies in form and floral structure (parts in threes). A Paul Revere of spring found nearly statewide, it is a signature member of that band of woodland ephemerals that march through their life cycles and disappear for another year almost before they can be noticed. Its leaves-broad, yellowish to dark green, pointed tongues dappled with brownish maroon spots-and then its flowers are among the earliest to emerge from the forest floor. The trout-lily has more vernacular aliases than a con artist, attesting to its widespread occurrence and popularity as a wildflower. Each features some prominent characteristic of the plant. Erythronium, the generic name, is derived from the Greek word for “red,” alluding to the violet-suggesting reddish-purple flowers of the only species in Europe (found also in temperate Asia), the first of the genus to be discovered. It was described by Linnaeus as E. dens-canis, Latin for “dog’s tooth,” which the bulb-like corm was fancied to resemble, hence the common name “dog-toothed violet” for this Eurasian species. Nearly all of the rest of the approximately two dozen species of the genus occur only in North America, mostly in the west. Except for at least two western ones that have deep pink flowers, most of the species have either white flowers or yellow flowers with perhaps a reddish tinge on the outside.. Thus, more apt for the eastern species are the names “trout-lily” and “fawn-lily,” said to have been coined by John Burroughs to replace the name inappropriately suggesting a violet. Why “trout”? The flowers remind one of a speckled trout and bloom at the beginning of trout season. Why “fawn”? The mottled leaves suggest the fawn’s spots, and the two basal leaves that flank the solitary flower on its naked, 4-6-inch scape mimic the fawn’s alert ears. “Adder’s-tongue,” another frequently used common name, may allude to the leaves that suddenly arch above the leaf litter like a serpent’s tongue or to the extruding stamens of the flower that conjure up a snake’s darting tongue. The cosmopolitan Lily Family, as traditionally circumscribed, is one of the largest flowering plant families in the world, with perhaps 250 genera and 3500 or more species of mostly herbaceous plants. Only 50-60 of the genera are native to North America. It is also one of the most important families economically, with medicinal plants (e.g., aloe, colchicum), edible plants (e.g., asparagus, onions), and a large number of ornamentals (e.g., lilies, tulips, hyacinths). Recent phylogenetic studies suggest that the family Liliaceae, as understood in the traditional, broad sense, should be divided into a number of families, reducing the Liliaceae to a narrowly defined family with as few as a dozen genera. Yellow trout-lily is a long-lived perennial that grows from a deep-seated corm, which gets larger and goes deeper into the soil the older it gets, sometimes eventually going down over a foot. The species is highly colonial, spreading not only by seeds but also by offshoot runners from the corms and forming extensive, forest-carpeting clones. Such colonies were found to be as old as 1300 years, averaging nearly 150 years in age, in one study. From seed to blooming takes 4-7 years. Until the corm reaches flowering size (is fertile), it produces only a single, ground-level leaf per season. Fertile corms produce a pair of essentially basal leaves. Most plants in any given colony are single-leaved, not yet fertile. The more or less elliptical, smooth, shiny leaves are short-stalked, clasping the slender stem at their base, and up to 6 inches long and 2 inches wide. Although the leaves are attached at ground level, they really are at mid-stem, because half the stem is underground and half forms the leafless flower stalk. The relatively large flowers track the sun and close at night. The yellow perianth parts (sepals and petals), often spotted at the base, are similar, except that the sepals may be brownish or reddish on the outside. In bright sunlight, the perianth may recurve so strongly as to give the flower an almost spherical look. The six stamens may be yellow or red, and the 3-parted, club-shaped pistil matures into a many-seeded capsule. The flowers are insect-pollinated, and the seeds are furnished with fat bodies called elaiosomes, which indicate dispersal by ants. Yellow trout-lily is a charming spring bloomer in partly shaded rock or woodland gardens and informal corners in the landscape. It can be propagated from seeds or offsets (new corms on underground runners) in deep, loose, relatively moist soil that is rich in organic matter. A winter mulch of peat or leaf litter is recommended. The seeds may not germinate until the second spring after ripening. There are reports of the leaves and corms being used for food by Native Americans. Yellow trout-lily grows in moist, deciduous, upland and especially bottomland woods and even in meadows almost throughout the deciduous forest region of eastern North America, blooming anytime from late February to May, depending on the location. Recently, a second eastern yellow species, E. umbilicatum, has been recognized in the Southeast. It is distinguished by small technical differences. 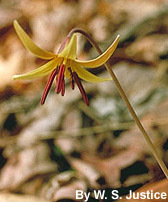 In Virginia, Erythronium americanum can be found in most counties, often in profusion. It blooms primarily in April. Erythronium umbilicatum is less common in Virginia. The wide-ranging midwestern white trout-lily, E. albidum, reaches Virginia along the Potomac River only in the Washington, DC, area. Gardeners should not collect yellow trout-lily in the wild and should be certain that all native plants and bulbs purchased for home gardens are nursery-propagated, not wild-collected. Text adapted from 2003 Virginia Wildflower of the Year brochure. Written and edited for the Web by Stanwyn G. Shetler, October 23, 2002.